« ALL ABOUT SWEEPSTAKES FEATURE ~ What types are out there and which ones should I enter? Maybe I'm paranoid and overprotective, but as the mom of a 3-year old little girl, I can't imagine ever letting her out of my sight without a way of getting in touch with her right away. Having the ability to communicate with her (and her with me) should we need to in case of an emergency would definitely allow me to enjoy my time without her much more, instead of pacing back and forth, worrying if she's okay. This leads me to the second issue. I want to give Riley the ability to call me whenever she wants, but I don't want her to have a cell phone. Personally, Michael and I think that the responsibility that comes with a cell phone is just too great for young children. I don't even want to think about all of the texting and cyber-bullying that seems to go on amongst kids these days and I want to try and keep Riley from that whole scene as much as possible. So, how can I keep in contact with my daughter without giving her a cell phone? With the Midland GXT 50-Channel Walkie Talkies from RadioShack! Keep reading to learn more! I reviewed the Midland GXT1000VP4 Communication Radios from RadioShack, which retails for $89.99. As an avid camper, fisherman and shopper, I have to admit that I'm no stranger to using 2-way radios. Long before cell phones even existed, walkie talkies were the way to communicate with those nearby. At the mall, my friends and I would split up and still be able to talk with each other as well as schedule a new spot to meet back up. While camping and fishing, a walkie talkie would make a great way to communicate with home base while out in the woods, instead of trekking all the way back to camp just to ask someone a question. But now as a parent, I plan on using 2-way radios as an economical solution for communicating with my child while she's over at a friend's house, at the neighborhood pool, sporting event, school event, etc. 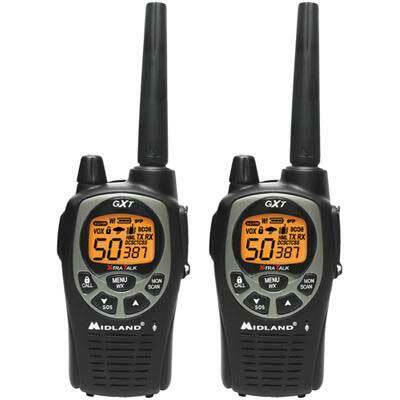 The Midland GXT1000VP4 communication radios from RadioShack will allow me to talk to anyone within a 36-MILE RANGE! That means, I could even use these radios to talk to my husband while he was at work! Since my husband and I speak to each other on the phone MUCH more than we do anyone else, I think that now I will be able to save a little money by lowering my cell phone bill's allotted minutes. Cell phone plans have gotten much cheaper in recent years, but the ability to save an extra $20 per month by using less cell phone minutes is huge! If your situation is like mine and you speak to one person in particular quite often, the Midland GXT1000VP4 communication radios might just end up paying for themselves! The GXT1000VP4 features the standard 22 GMRS channels plus an additional 28 channels. The GXT1000 meets the JIS4 Standard of exposure to water for 30 minutes and features the maximum power allowed for GMRS handheld radios for up to a 36-mile range. Weather scan finds the nearest NOAA broadcast to stay up to date with the latest weather and hazard information. Unlike other GMRS radios on the market that use lithium batteries, Midland's Dual Power Option allows the use of the included rechargeable batteries or 4 "AA" batteries (not included). If you still have a hard-to-buy-for person on your holiday shopping list, I highly recommend the Midland GXT1000VP4 communication radios from RadioShack. Whether an avid camper, a soccer mom or a person who'd like to save a little money on those high cell phone bills, the Midland GXT1000VP4 is sure to satisfy! 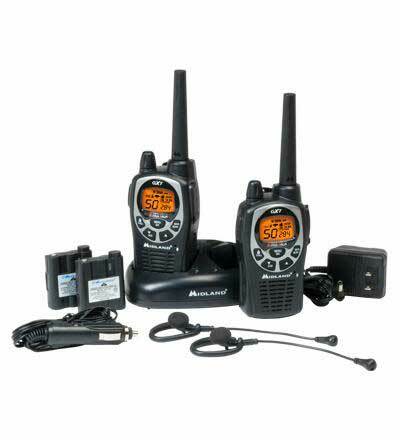 Disclosure: I received the Midland GXT1000VP4 Communication Radios from RadioShack in order to facilitate my review. No other compensation was received. This product review is based on my own personal experiences with this item and is completely honest and objective. Only thing I would add is that you need to remember if you use the GMRS portion of these radios, you DO need an FCC license. The “Family Radio” channels are free, but last time I checked the GMRS license was about $70. This is something the seller may not tell you. I have used these radios for about 15 years or more and am an advanced class Amateur Radio operator. So be sure to get a license to take advantage of all the frequencies on this.